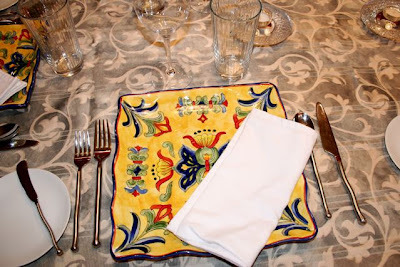 As promised I will be posting details of the dishes I prepared for a five course dinner last weekend. So, let’s start with the first course, shall we? Inspired by a classic caprese salad I created a roasted beet salad with fresh chèvre, balsamic vinegar and basil oil. I was dying to use some of the plethora of beets I have maturing in my garden right now. This turned out better than I anticipated. The beet preparation could not be simpler. I love roasted beets and they are so easy to do. I just take them from the garden, trim the roots and stalks, and tightly wrap them individually in foil. No need to skin them. They were placed on a sheet and roasted in a 425 °F oven for about an hour. Once cooled the skins will slip right off. I used three kinds of beets. One is a yellow beet called ‘Touchstone Gold’. I also have a ‘Chiogga’ beet which has red and white stripes inside. These two beets are tasy and the colors hardly bleed. Unlike the purple beet, ‘Red Ace’, which will stain anything it touches. 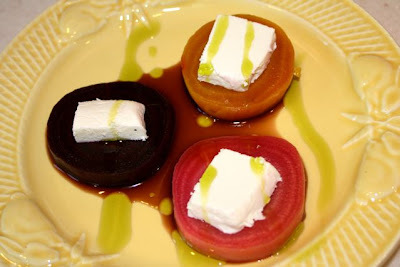 Personally I like the sweetness of the yellow beets the best but the purple ones have the most classic beet flavor. 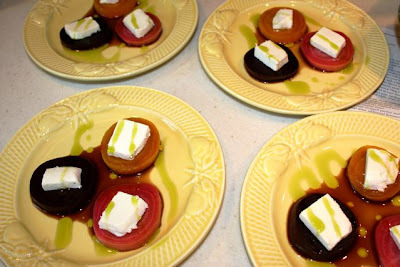 On top of the beets was placed some fresh goat cheese. A bit of balsamic vinegar was poured in the middle and the plate was garnished basil oil. 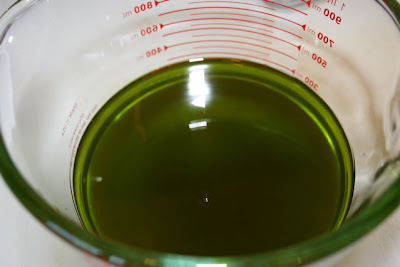 Basil oil is so easy to make. I took about a half cup of tightly packed basil leaves and 1 cup of good olive oil in a food processer and processed it briefly to chop up the basil. This was placed in a pan and heated for about 5 minute to infuse the oil with the flavor. Careful not to cook it. I heated it until the traces of water started sizzling and bubbling. The oil was poured through a strainer and cooled. 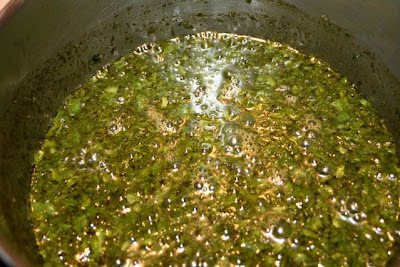 The result is a deep green colored oil with tons of basil flavor. Next up – linguini carbonara. Stay tuned. This past weekend I made dinner for some dear friends of ours. Over the next week I will be posting more details on these dishes but I wanted to share with all of you what I came up with. First of all let me share the table setting. Nothing too fancy but I did pull out the TJ Max plates that I posted recently for a Sunday Chicken Dinner. The evening started with some cheese and crackers. 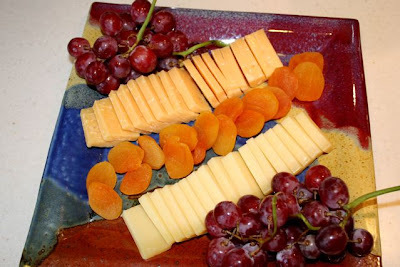 On the plate is some gruyère and some aged gouda cheese along with some fresh grapes and dried apricots. This plate, by the way, was made by Bismarck artist Susan Davy. She makes fantastic artistic pottery. The glaze contains flax ash from North Dakota farms that provides for the wonderful amber colors. I was thinking about a caprese salad for a first course but my tomatoes are terribly behind this year and the quality just wasn’t there. On the other hand I have a bumper crop of beets. So, inspired by a caprese salad I made a roasted beet version. 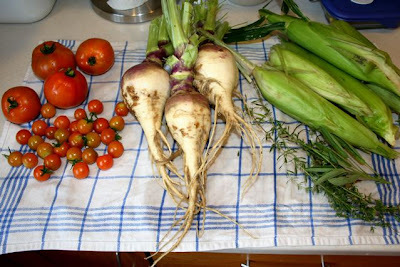 Here we have three kinds of beets – chioga (red and white striped), yellow and purple beets. Fresh goat chese was placed on top and the plate was garnished with some balsamic vinegar and basil infused olive oil. 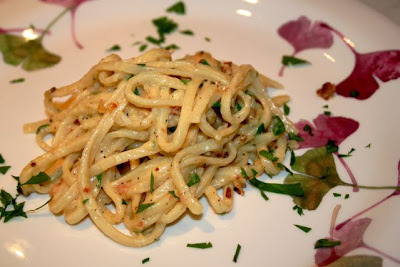 The second course was a classic linguini carbonara with pancetta. It turned out better than I imagined and was a hit of the evening. My wife made homemade whole wheat rolls. The recipe was from Rose Levy Beranbaum’s Bread Bible. 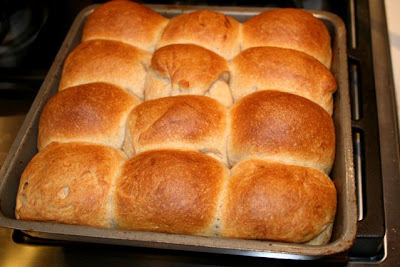 The dough was fermented for two days and the rolls came out light and soft. 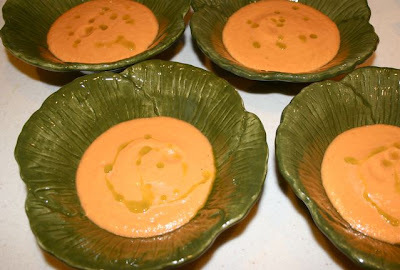 The third course was a fresh, creamy traditional Spanish gazpacho. The recipe came from David Rosengarten who recently shared it on Lynne Rossetto Kasper’s radio show, The Splendid Table. The main course consisted of herb infused meatballs. I used fresh sage and fresh thyme in these. They are made from a mixture of beef and pork. 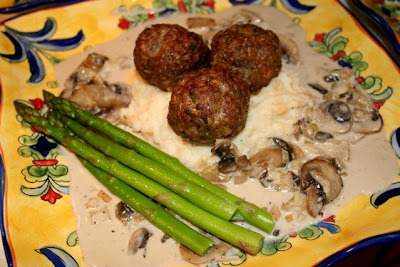 The meatballs were served on top of garlic mashed pototoes and rutabagas. A creamy mushroom sauce complimented the dish. Finally – DESSERT! 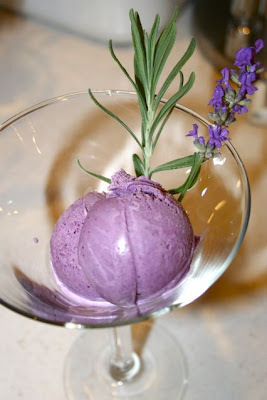 On a cooking/gardening forum I participate in there was a wonderful recipe from BlueMoon for a Lavendar Blueberry ice cream. This is a fantastic recipe which I’ll share with you soon. Come back for more details on these dishes coming soon. It has been a long time since I’ve had pot roast. Meat so tender it falls apart in shreds. Hearty, comforting root vegetables glistening with pot juices. Aromas of thyme and winter savory wafting from the bowl. And the best part about pot roast – LEFTOVERS. A perfect meal on a cool fall day. I started with a 2.8 pound arm roast. 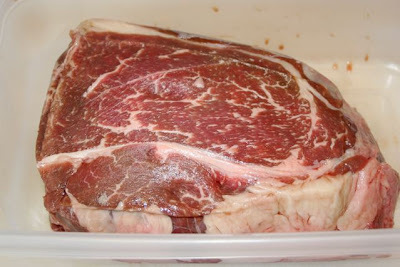 This one was nicely marbled with fat which is so important for a tender and juicy end product as it slowly cooks. 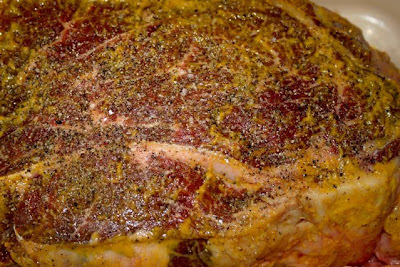 I seasoned the roast liberally with some salt, pepper and yellow prepared mustard. You don’t really taste the mustard in the end but it does add another dimension to the flavor that would be lacking, I think. 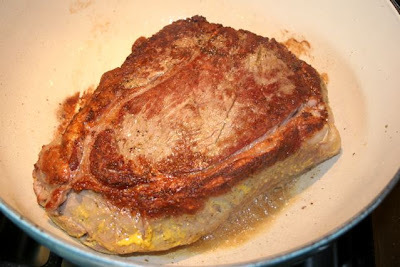 The roast was first seared in a hot heavy pot with a bit of olive oil for about 5 minutes on a side. This also creates another layer of flavor with the caramelized brown bits flavoring the whole dish. 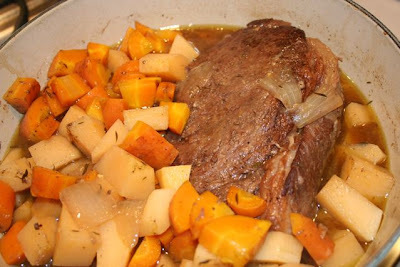 Some of the other ingredients for this pot roast are shown below. I made a bed of onions, garlic and fresh herbs (thyme, winter savory and sage). 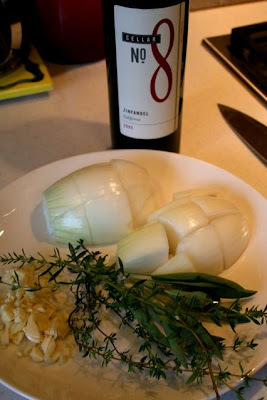 A bit of red wine was used to provide moisture and flavor. I like a fruity zinfandel. I placed the onoins, herbs and half the garlic on the bottom of the pan under and placed the seared meat on top. 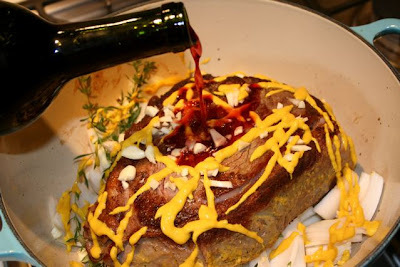 Additional garlic and yellow mustard were sprinkled on top and then about 1/2 cup of red wine was added. The pot was covered and placed in a 250 degree F oven for its long slow cooking. I left it alone for three hours. 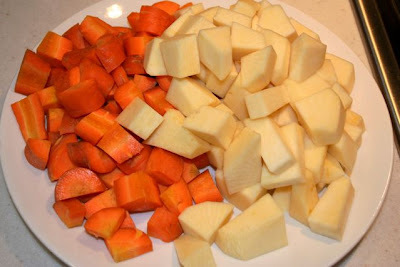 After three hours a couple of cups each of carrots and rutabagas were cut into large chunks and added to the pot. The temperature was raised to 275 °F and it was allowed to cook covered for another hour and a half until the vegetables were thoroughly softened. You can see the end product at the top. Notice how much moisture is in the pot. This comes from the onions and the meat mostly. It is a delicious broth flavored with the meat, herbs and subtly by the mustard. 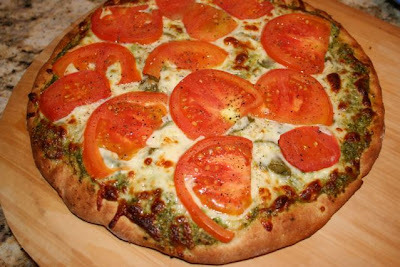 Nothing says summer yum like a pesto pizza with fresh tomatoes. I used the same pizza dough recipe that I’ve blogged about recently. Instead of a tomato sauce I used freshly prepared pesto (all basil this time without the spinach). This was slathered on the dough and topped with mozzarella and fresh tomato slices. It was very satisfying. I haven’t really posted much about the food I grow. I do have a pretty good-sized garden where I grow herbs and vegetables. This season has been quite slow for the warm weather crops but the cool loving veggies have been doing great. I’ll have an overabundance of beets this year, that’s for sure. Today I managed to find a few tomatoes finally getting ripe. Some of the very slow growing sweet corn is producing an ear or two. I also yanked out a few small rutabagas and some fresh thyme and sage to throw into a pot roast tonight (blog post coming soon).